The TrekQuesters are three mostly normal guys — two brothers and their dad — who have been into geeky stuff for as long as they can remember. Victor (AKA “Dad”): An accountant, financial planner, and serial entrepeneur, Victor watched the original Star Trek series live as a teenager growing up in New England. Just as the series was being cancelled in 1969, he was drafted to serve in the Air Force in Viet Nam. He returned home, married and had four children, including two sons destined to become podcasting Star Trek geeks. He collects old baseball cards, rocks out to C.C.R. and “Sloop John B.” on guitar, and plays a mean game of (two-dimensional) chess. Kevin: Trained as an historian and documentary filmmaker, Kevin has worked as a web designer and manager for the past fifteen years. A proud father of three (with a fourth on the way! ), Kevin enjoys hanging out with his lovely wife, playing boardgames, messing with digital photography, and dreaming about classic cars. In addition to science fiction, Kevin is a huge fan of modern design and architecture, and can often be found reading books about Frank Lloyd Wright. Brian: An accomplished engineer, Brian’s day job is to help keep American soldiers safe while flying the unfriendly skies. Brian is a loving father to his three children, the oldest of whom is about to graduate from high school. Brian is a talented artist, both as a painter and a musician, and a pretty darned good cook as well. A huge sports fanatic, Brian’s a fantasy football junkie who’s passionate about the Patriots, the Red Sox, and all things NASCAR. 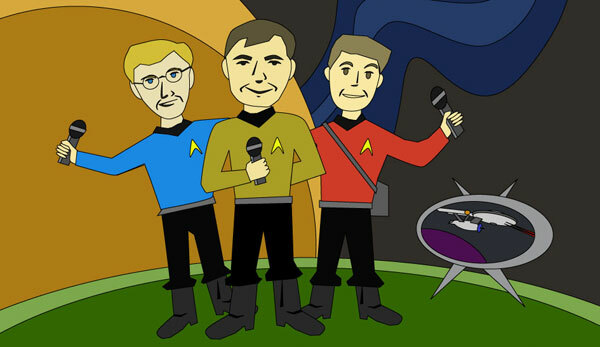 The TrekQuest podcast is something we dreamed up to give us a reason to stay connected despite the fact that we live over a thousand miles from each other. We hope others will enjoy our journey, too.